Lanjigarh : Vedanta Limited Lanjigarh bagged the prestigious Fame Excellence Award 2017 in Platinum category for its significant contribution towards women empowerment initiatives in the region. Under its livelihood project ‘AAJEEVIKA’, CSR team of the unit has been working on skill-development training, bank-linkage and other necessary support to local women involved in various micro-enterprise activities through group based and individual entrepreneurship exercises for income generation through Project Sakhi. Currently 176 women SHGs with more than 2000 women are being promoted for alternative livelihood activities. 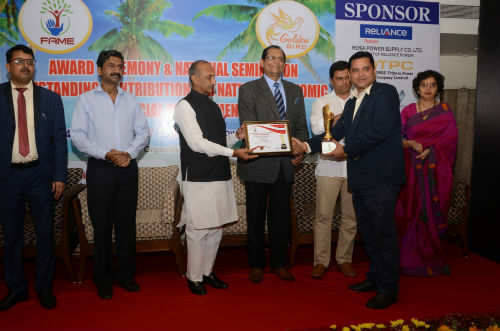 In an event organised by Fame India, Delhi at Goa on 24th September, Mr. Ranjan Sharma, Head CSR – Odisha Bauxite and Mr. Bharat Bhusan Joshi received the award on behalf of the company from Mr. D.D. Sharma, Chairman and Ms. Nanki Sharma, Director- FAME INDIA, Mr. Francisco Sardinha Former-Chief Minister of Goa, Mr. J.P. Aggarwal, Formar M.P. President Delhi Pradesh Congress, Mr. Jayesh Salgaonkar, Minister of Housing Board – Goa and Ms.Vrushali Vivek Parsekar.